A Native American shaman places a curse on Henry Parker. I am a shaman. I realign the harmonics of the universe. I don't make house calls. Shamanism is a form of magic which practitioners can use to know the unknowable and answer the unanswerable. Shamans can be experts in mysticism and esoteric divinity as well as healing. Through a mixture of different hoodoo spices, a shaman can draw on the strengths and powers of animals by feasting upon their organs. Among the Ghostfacers is the cameraman Spruce, who is also a licensed shamanologist. When he was diagnosed with Stage IV carcinoma that had advanced past the point of treatment, Chef Leo visited a Pawnee shaman, who helped him find a cure. Through a mixture of animal organs, hoodoo, and spices; Leo was able to strengthen his body and keep the cancer at bay, in addition to acquiring abilities associated with whatever animal organ he consumed. However, the effects were only temporary, forcing Leo to constantly consume various animal organs to stay alive. Through "combination therapy", Leo discovered that the consumption of a mixture of animal organs made his body even stronger and caused the effects to last longer. With Jack's health worsening, Sam is directed to a shaman by the name of Sergei by Ketch, who claimed the British Men of Letters swore by him to help solve unsolvable problems. Sergei is an expert in mysticism and esoteric divinity, having studied under myriad witches, holy men, and seers, but considers himself a healer more than anything. Learning of Castiel's Nephilim problem, he claims Jack's condition is not reversible, but can be stopped through a recharging agent. Retrieving a vial of archangel grace he received from Gabriel in exchange for a cloaking spell, he tells Castiel to give it to Jack along with the precise recitation of a spell, and that in exchange for those items, the Winchesters will owe him. 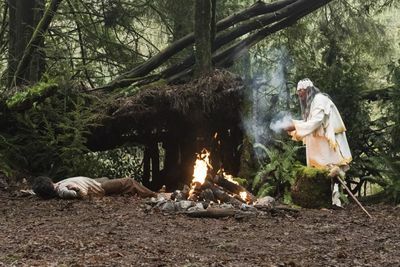 After Sergei's spell fails to save Jack, Castiel places a call threatening the shaman. In an aloof manner, Sergei claims that science is trial and error. Learning that it was just an experiment, Castiel tells Sergei if Jack dies he will be coming for him. Sergei dares him to try. Sheriff Mason Romero reveals that the kohonta is a man named Henry Parker who was cursed by a Native American shaman for engaging in extensive cannibalism of not only Henry's own family, but the local Native Americans. This page was last edited on 11 April 2019, at 23:13.